Today I have stayed behind to enjoy “doing nothing” at this enchanting villa by the sea. Carol went for a little hike earlier up more stairs and around a cliff. My calves were still complaining from yesterday’s climb down the world’s longest steepest staircase so I hung back to sit in the sunshine, read, write, and think. I could sit and stare out a the bright vast horizon and open luminous sea for years and years, centuries, and not get tired of the view. It’s good to sit and breathe in lungfuls of lemony air. Soon we will go into town for some gelato and a stroll down to the lower part of Praiano – Vettica Maggiore. Mama Mia! In the afternoon Sister and I headed down to San Genaro, the church with the majolica tile floors. This little neighborhood church is my favorite so far and today there were roses, amaryllis, iris, calla lily, and other flowers decorating all of the altars. From here we decided to explore the walkways leading to the sea. 300 steps down and back. The walk down was exceptionally fabulous and we passed many vegetable gardens. One in particular being tended as we strolled by on a walkway just above. A handsome older fellow with white hair and skin browned by the sun, digging in espresso-colored earth. We stood above him and could smell the soil. So fertile! This is the land of the mighty fig, olive, and lemon. All growing there in the the dark loamy earth on terraces overlooking the blue blue sea. I imagine the contentedness a gardner in the Amalfi Coast must feel being a steward of land as magical and wonderous as this! We encountered only 1 couple (toting a baby buggy!) on the long way down to the tiny beach and sea wall. There were many spots to rest and take in the quiet blustery day. I tried not to think of the climb back up. Sister scouted the path ahead and kept calling back, “We’re almost there! Only a few more stairs! You can do it!” Without a personal coach I would have given up after the first 100 steps. At last we reached the bottom and unbelievably a fine restaurant spread out on a terrace above the sea wall. We paused for lemon sodas overlooking wild crashing turquoise water. This place is so beautiful…it almost seems to be something that one might conjure up in a dream! very observant photo of the tiles spilling out onto the threshhold in No. 5. i love seeing this country through your eyes. I’ve been eyeing all your wonderful photos and reminiscing about my travels there. I loved this place. Thank you for sharing this journey. OMG, I hope this trip never ends. It’s just delightful and your journals are scrumptious. Thanks for taking me along! Every 40 steps or so I stopped for a nice rest. With resting all things are possible. Yawn. Speaking of which, it’s time for my mid-morning nap. I love reading your posts, and your journal should be published with all those great photos, what a magical trip you had with your sister. How about the trip up the stairs. “Lemony air”….sigh. I really do feel like I need my passport with me to read your blog entries. I’m so enjoying my mini Italian vacation, thanks to you, your wonderful writng and fabulous photographs! I don’t envy you the 300 steps back up, though. I can go down but I HATE going up. so, what about the trip back up? Did you put yourself through more specific physical training to prepare for all of this walking, hiking and exertion? Enthusiasm will take you far, but what about that trip back up those stairs? I was just wondering how you printed pix when you were there, and then I saw Chrissy’s question. How DID you do that? Or did you wait to do some of it after you’d returned home. I know that you prepared the journal pages and assembled it before leaving. You may have already told us, but my old memory often forgets to remember things. I’m loving your trip. More, more! You are so generous, to share all this magic with everyone! I’m refreshing my link several times a day, just to be sure I get the updates as soon as they are posted. Next time I will volunteer to be your baggage porter. Fabulous photos, wonderful journal, a privilege to share your journey. One day, will you tell how you managed to sew your photos into those pages while you’re away? 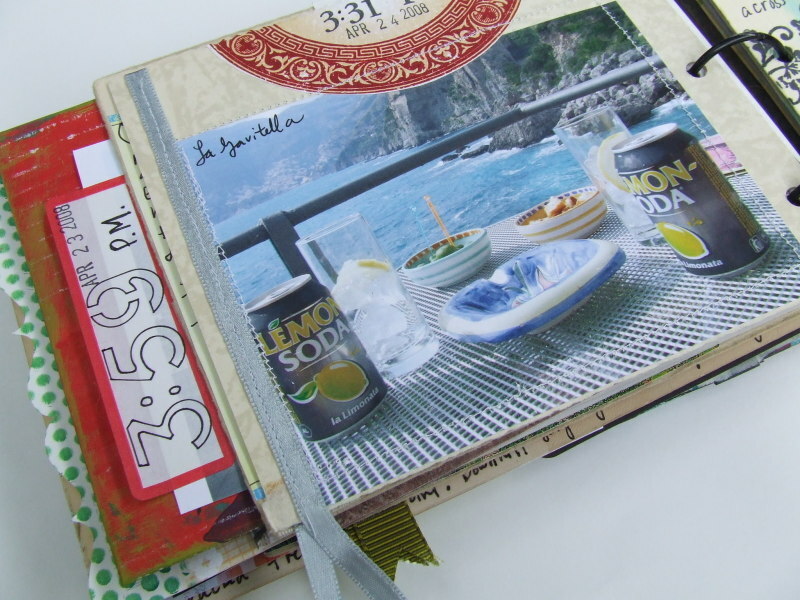 And how you’re able to make these finished journal pages in situ? I’m imagining you with trunks of equipment, like leisured American ladies of the late 19th century, travelling Europe!